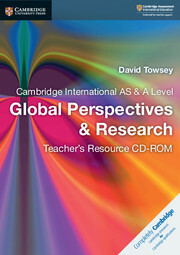 This Cambridge Elevate edition is the only resource endorsed by Cambridge International Examinations for Cambridge International AS & A Level Global Perspectives & Research (9239), for first examination from 2016. It helps students and teachers understand the Critical Path via exploration of international topics, such as climate change. This helps develop students' ability to think critically and consider alternative viewpoints in preparation for university and employment. 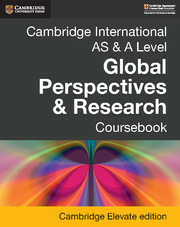 With exam-style questions, group discussion activities and personal reflection, the coursebook provides structure through a skills-based syllabus, while helping build life skills. The upcoming teacher's resource CD-ROM contains suggested answers to coursebook questions. Colour-coded signposts to the Critical Path on every page help teachers and students apply critical thinking, problem solving, research and communication skills to internationally important topics. Discussion points and reflection points help students review their progress and consider multiple perspectives on a given topic. Exam-style questions help learners familiarise themselves with this modern course by tackling practice exercises. The coursebook demystifies the Critical Path, helping students to become comfortable using deconstruction, reconstruction, reflection, communication and collaboration skills.